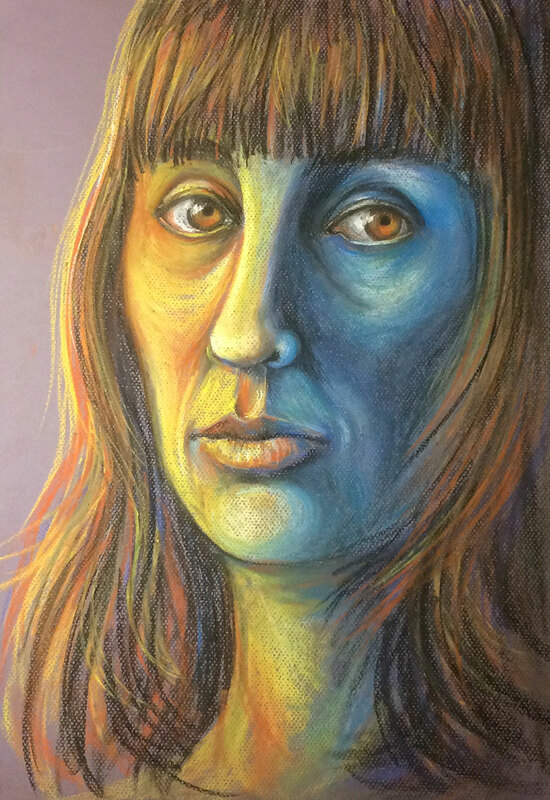 “First of all, I found it really interesting to create a self-portrait with chalk pastels, a material I had never used before. It was also challenging (and liberating) to draw in a bigger format than what I’m used to. I felt really curious and happy to be out of my comfort zone. 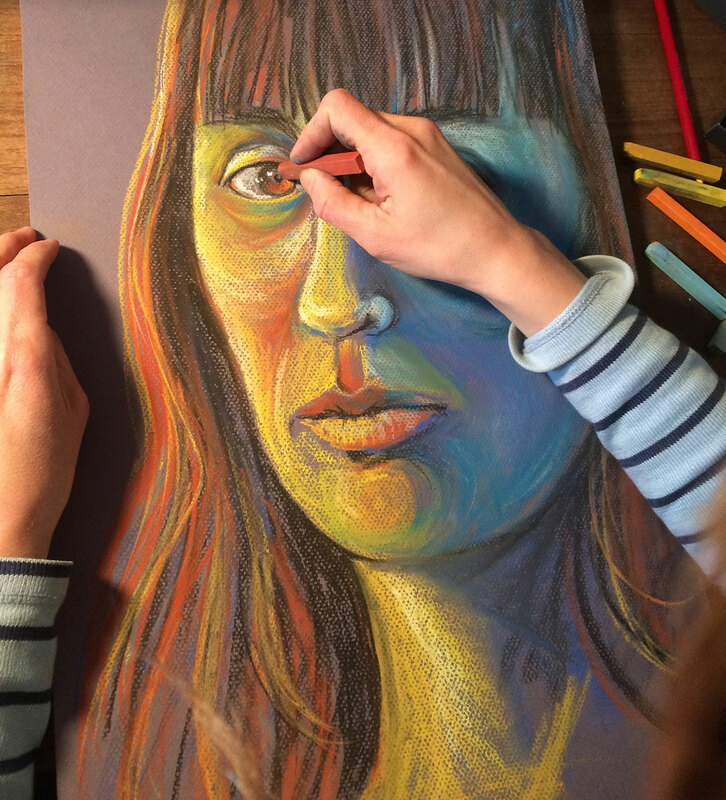 Regarding the course, I must say each step is very well described and guided, and once you watch it, it makes you want to grab crayons or pastels and start drawing at once. 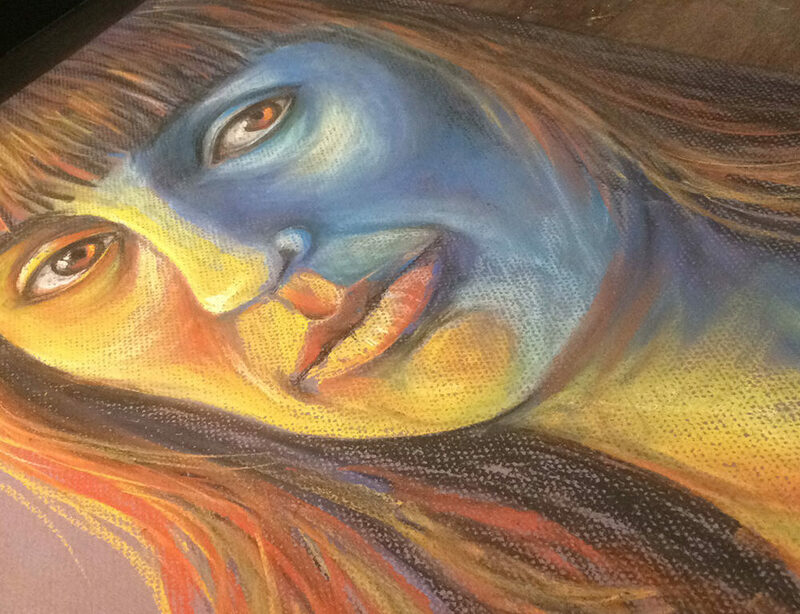 3 responses on "Sole Afra Martinez"
Creating texture can be so hard to do in pastel, and you’ve nailed it here! The skin and the hair clearly stand apart as two distinct surfaces, and that’s all from the control of the medium you’re displaying. For your colors, while they’re working well as complementary I’d like to see you play in your next pieces with taking them further. 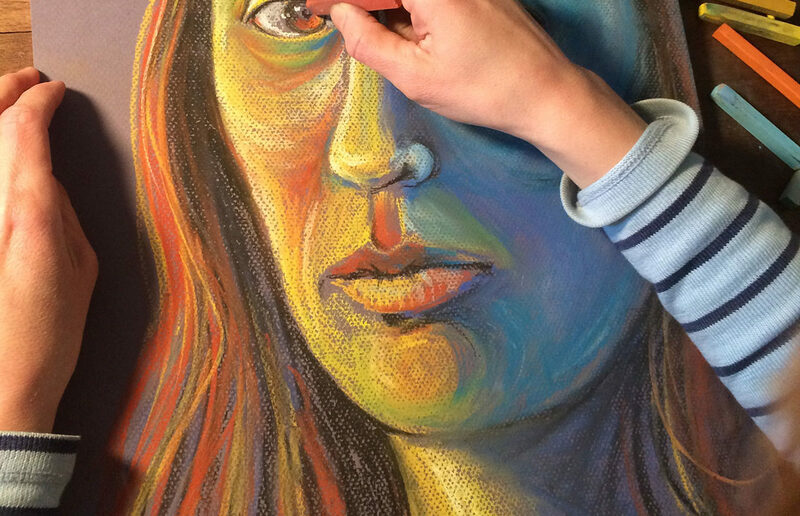 Playing around with subtle tones and striking bold colors – right now, you’re starting to do that with the soft violet color in the background playing with the yellow, but look up some other pastel artist to see how they’re making that color play do some extra work for them! Odilon Redon is a great artist to look at, because they use pastels in a pretty exciting new way that’s different than the run of the mill portraiture. Look especially at how the pieces have areas of extremely vibrant colors playing off very dull and boring colors! 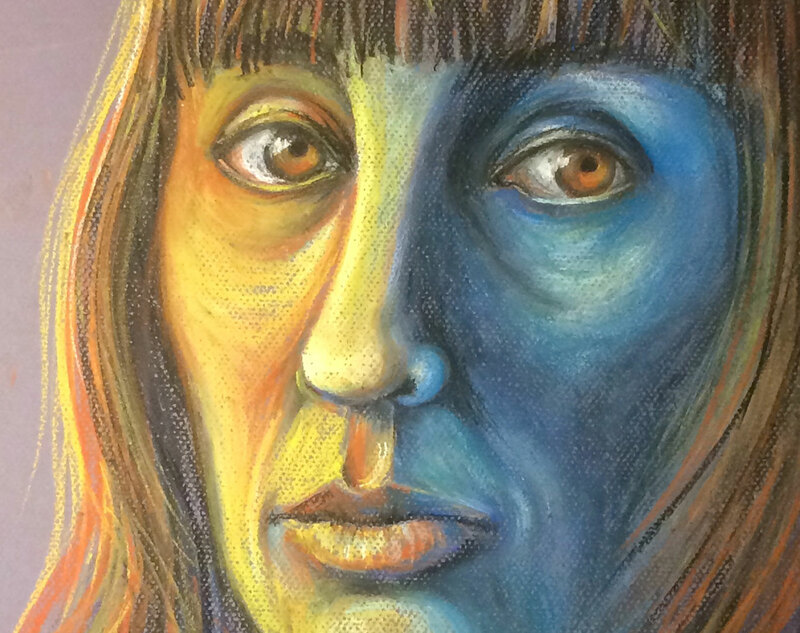 This is so cool that you created such a beautiful self-portrait with this course! My favorite part has to be the contrast between the amber eyes and blue skin. It’s very striking because of the complimentary colors and makes the eyes look like they’re shining. You’ve also taken great care in articulating the individual strands of hair, creating a textural contrast against the skin. I like how we can see individual colors in the hair that optically mix into a collective brown. I’d love to see you use this kind of optical mixing in the face. 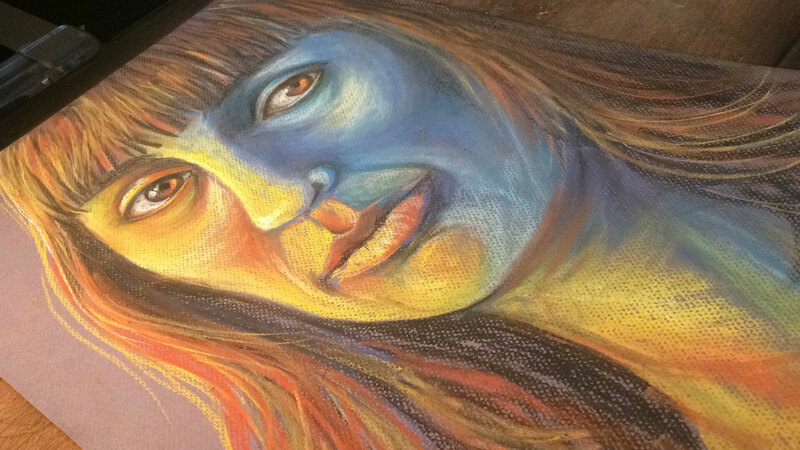 Right now half is very much yellow, and the other half is very much blue, which creates a lot of drama, but I could see you going even deeper into the colors of the skin, as you did with the hair. It’s great to see you working with new materials, it’s obvious you were really digging working on this piece. Keep it up, I think this large format is really working for you! You’ve done a truly excellent job with this prompt! In particular, your use of the complimentary color palette is really striking… And I can really tell that you’re having fun with the larger format! The broad, circular gestures of your marks give the piece a really lovely energy. 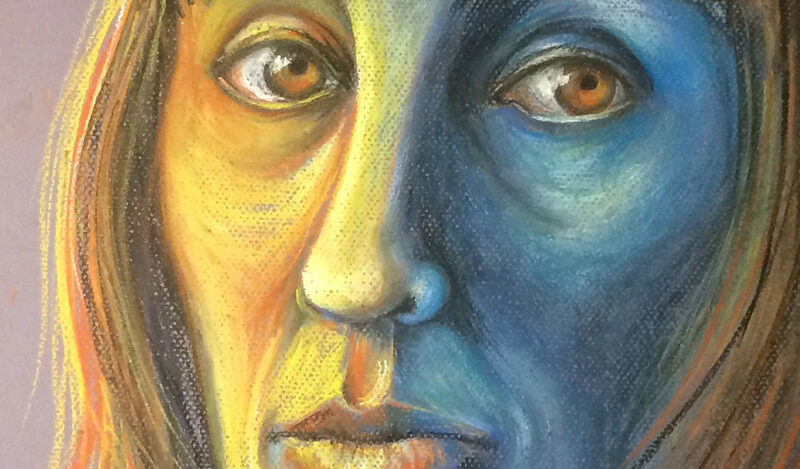 I look forward to seeing more chalk pastel pieces from you in the future; perhaps another self-portrait, exploring a different kind of facial expression? 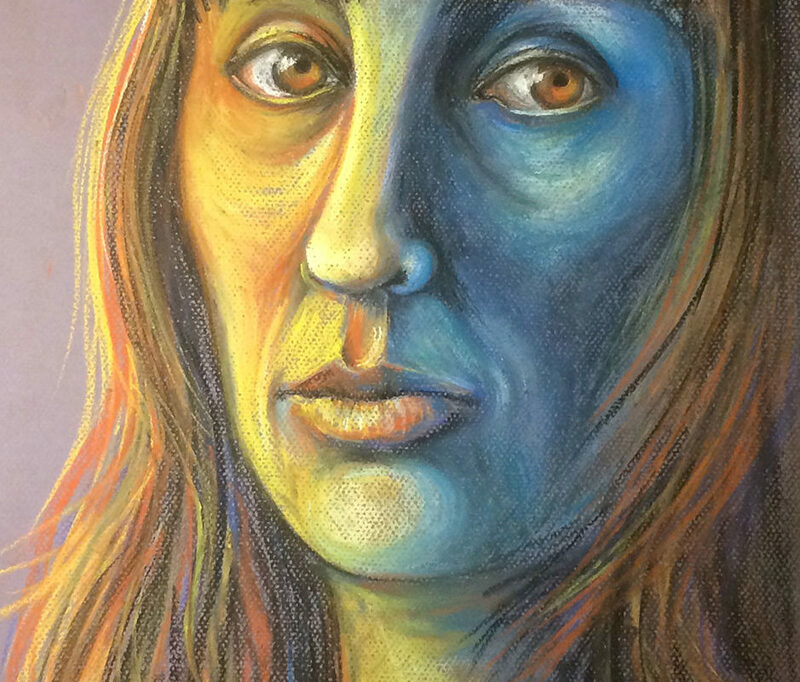 Your mark-making with this medium has such a strong, emotional quality to it — great for portraiture!